The Pentair IntelliFlo High Performance Pump is the world's smartest swimming pool pump. Its onboard computer and intelligent software automatically calculate and program the minimum flow requirements for every pool task - filtering, heating, cleaning, spa jets, water features and more - to optimize performance and minimize energy use. 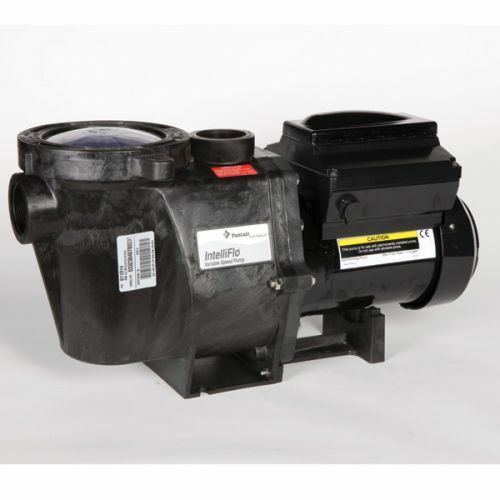 As functions/tasks change, IntelliFlo self-adjusts to maintain optimal flow rates for further energy savings. Did you know a Standard pool pump can consume as much energy as all other home appliances combined, often costing upwards of £1000 a year. However The IntelliFlo VF or Variable Flo can typically cut energy use by up to 90%. The basic thought process behind this type of pump is simple. Run you pump for longer, but at lower speeds. The savings are unbelievable, and the best thing is your water quality could even improve because you are filtering the water 24 hours a day. So not only does the pump start paying for itself as soon as its installed but it could improve your water quality. The other great feature about this pump is its so versatile. You could run water features, and spa jets. At low flow the pump is almost silent, which makes it great from people with sensitive hearing or places where noise travels. The permanent magnet in this motor ensures a output efficiency of aprox 90%. That makes this type of pump about 30% more efficient that a standard pool pump. The significant saving this pump can offer means it could pay for itself in 2 years or less. Please call if you have any questions before ordering we can supply a wide range of swimming pool Pumps and Filters not yet on our website. Here you will find all the product details you will ever need. © 2019 - Designed by Datalinks Software Solutions (DLSS) - All Rights Reserved.